Ask, as the saying goes, and you shall receive. 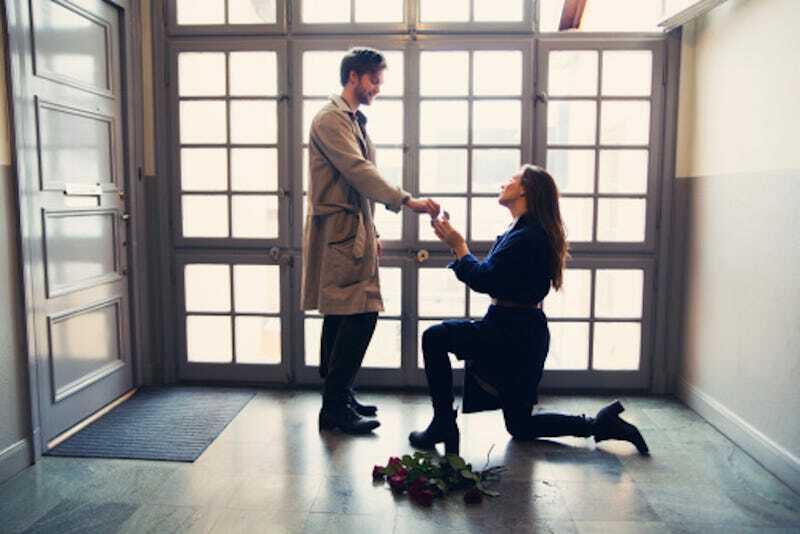 A reader requested that we solicit stories from women who have gotten down on the proverbial bended knee to ask for their partner’s hand in marriage. And while there were a lot of stories about accidentally proposing (“Do you think we should get married?” “Sure.”) and proposing in a fit of pique (“WHEN THE HELL ARE YOU GOING TO MARRY ME, HUH?”), what we were really looking for here were the planned out proposals. I proposed and it was the most badass thing I’ve ever done! Then, early last year I had a seizure and ended up in the hospital. This lead to brain surgery, which, nothing like an imposing life threatening ordeal to put things in perspective. Life is just too damn short, you know? After I was home from the hospital post-seizure with my surgery scheduled, we woke up on his birthday on February 23rd. I got up and brought him coffee in bed (because I’m not allowed to hold him to ANYTHING he does/says pre-coffee) and asked him simply and nervously if he would be my husband and do this hanging out thing forever, while presenting him with his engagement wing. Thankfully he said YES and we got married six months later. Funny enough, a month after I proposed, he presented me with a ring (family ring) that he and my mom had been working on for months. I asked him if he felt deprived or disappointed at all and he said he wouldn’t have it any other way. Does it count if you proposed to another lady? I feel like it’s less weighted somehow without having to worry about, idk, bruised machismo. But also it was weird because neither one of us had been raised to do the asking! So anyway, much like when we began to date, I - as the more outgoing, more foolhardy of our pair - took a deep breath and gave it a shot. I didn’t want to buy a real ring without her input, so I brought along some costume jewelry to a romantic weekend away. I almost proposed twice before I did - once in an art museum, in front of a beautiful painting, and once while we were alone at a show - but held back because public, no, no. Finally we went for a walk in the park before our road trip home. We sat in the sunshine on a rock overlooking a lake, and I kept screwing up my courage, then wimping out. Finally, I gave up. I was so sure she would say no - I gave it a 25% chance of total no, 50% not now, 25% yes. Then she said something I’m embarrassed to admit I don’t remember, which prompted me to blurt out my proposal, which was too nervous to be suave, but was heartfelt. Fifteen terrifying seconds later, she said yes. Best most scary thing I’ve ever done in my life! My guy and I have been together since just after high school, and had talked about marriage in the past. We decided we’d make it official when we felt ready. I felt ready. So ordered a cute wooden ring online and suggested that in lieu of Christmas presents take a trip up to the mountains for snow-mobiling, ice-skating, and a romantic getaway (I hate skiing). Our first night there I suggested we ice skate in the pond behind the hotel and proposed outside while we were looking at the stars. I was surprised by how nervous and emotional I got so my pitch wasn’t exactly eloquent or anything, but I told him that I’m happy with him and I want to spend the rest of my life with him, and would he marry me. He said of course and we kissed. After cuddles and kisses we went back to the hotel room to call our families. A few months later he gave me a ring too, and nervously threw it at me while we were already in bed at home. He said he was super nervous even though a) we’d already been together for 8 years, and b) we were already engaged. I was glad he said that though, he got a taste of how nervous I was and why my proposal was so short and sweet. I proposed to my husband. It was great! We were planning on going to a Halloween party. For my costume, I made a dress with “Will you marry me” written on the front. I made a t-shirt for him that said “yes”. I bought his favorite flowers and put on “Please Please Please Let Me Get What I Want” (I later walked down the isle to the instrumental of this song) and put on my dress and called him into the room. I proposed, and offered him the yes shirt. He accepted, put on the shirt, and we went to the Halloween party in our costume - Newly Engaged Couple. I proposed to my husband publicly-ish. It was amazing - but I was SO full of nerves! Him and I had made little jokes here and there about marriage and babies but we hadn’t had “the talk”. One weekend, a group of us went camping for his birthday. I had planned to present him with this really cool old knife I bought him and had engraved. But the entire drive up there I had this sense that I wanted to see him with it - forever. Like I knew I wanted to marry him. So on the last night, before the last campfire of the trip, I asked him to meet me by the fire pit (naturally a group gathered, wasn’t really part of my plan but what I do ask them to leave?) We sat down on a log and I started to tell him about how I wanted him to be the guy who took me camping. For always. I gave him the knife and I asked him if he would marry me and he said yes! Well actually he jumped up and was like “HELL YES”. And of course everyone heard so they broke out the booze and we had a great time celebrating my very random proposal. ooooh! I just woke up and asked my husband for the laptop so I can write this! Finally a story I can contribute! I proposed to him one year ago yesterday (June 15, 2014). We had been together about 5 years at the time, and though we both knew marriage was on the horizon two things had happened that made me decide I wanted to be the one to do it: #1 I was getting impatient, #2 I am a graduate of 8 years of women’s education, am an avowed feminist and decided you know what, this would be really cool, a great story and I think he would dig it as much as I would. I decided to propose about a year before I actually did. I also decided I needed to pop the question with something in hand, so I started researching luxury watches (got some help from knowledgeable friends in this area). About 6 months into it, I found the perfect watch and had saved enough to buy it. Then I made the proposal weekend plans. My dude is a huge fan of Disneyland and California Adventure, so the obvious choice would be to pop the question there. But instead, I decided we were going to spend the weekend in Temecula wine country, where they conveniently offer hot air balloon rides. I was going to recreate on of his favorite rides from the theme park (Soarin’ Over California) by taking him... actually soaring over California. So I make the reservation, tell them it’s an unusual proposal, book a room at a local winery and tell him we’re going to celebrate our 5 year anniversary a little early. He asks no questions. Actually, he almost ruined everything by taking me away on a different weekend getaway the week BEFORE mine, in which we spent the whole time going from scenic vista to scenic vista and... no proposal. So anyway, we get to Temecula. All my friends know what is going down, as do my parents and coworkers. And I start to get really nervous. Like, I’m 99.9% sure I know what his answer will be, but the actual asking part is so scary that I’m really really tempted to just skip it. This is where having other people know the plan helps - it’s harder to chicken out. It took him one second (still filming, now filming his own proposal) to realize what was happening and give me an enthused though surprised yes. He even got a little teary :) Our audience laughed and cheered and we all celebrated with a champagne breakfast when we landed. We immediately called our parents and closest friends to announce it. We just got married on May 31st, and as I type this he’s lying next to me in our condo on the Big Island of Hawaii where we’re finishing up our honeymoon :) And yes, about 6 months later he surprised me with a ring. People love our story almost as much as we do. To the girl looking for ideas... do what the dudes do. Make it special and memorable for the two of you. Does he collect anything? Can you get him something symbolic of your courtship? If not, get him a ring and maybe put it on his right hand (so he can put the wedding band on his left). Just put some love into it, I promise it’ll be magical!